Our site is best viewed with 1024 monitor resolution or larger and in Firefox or Internet Explorer, Chrome has a problem with our links above. Please refresh all pages you visit each time you visit to see any changes made. Like to shop ~~ Want to help ABATE raise $$$ ~~ Shop with Amazon Smile!! Simply go to Smile.Amazon.com and choose “Abate of Florida Safety and Education Inc.” from the list of charities. Thanks for your support!! 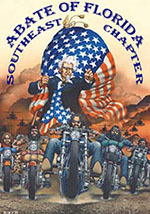 We are South Florida Bikers dedicated to the protection of the individual rights of motorcyclists through political change, charitable works, and public education. 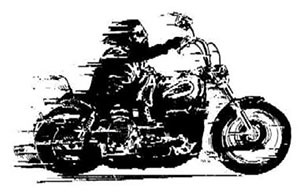 ABATE of Florida, Inc Southeast Chapter is a not-for-profit volunteer organization that fights discriminatory legislation aimed towards the motorcycling community. Our goal is to keep you informed of legislation that may affect your rights as a motorcyclist and as a citizen. We feel as the riders of Florida we should be the ones that decide on what we ride and wear on the roads of Florida. We strongly believe in individual freedom and protecting our rights to ride by working within the legislative and regulatory process. Our goal is to keep motorcycling free from unjust and unwarranted laws and to promote those that benefit motorcyclists. In other words "Education, not legislation"
We also provide you with the latest Safety information on safe motorcycling. Enjoying our Florida roads, safer riding skills, motorcycle maintenance hints and tips, safety products for your motorcycle, motorist education programs. There are no requirements to join us and we respect and welcome all motorcycle clubs or any other motorcycle associations or organizations. We do not have any mandatory meetings or rides. 1. Every current member of ABATE of Florida, Inc is automatically provided with a $4,000 accidental death and dismemberment policy at NO COST thru A.I.L. (American Income Life) as long as your membership is current, you are covered! 2. Included with every AbateSE membership is an exclusive subscription to AbateSE Monthly Newsletter and the Abate of Florida, Inc quarterly Masterlink that is available only to members. 3. All current AbateSE Members receive free advertising on our website. 4. The sense of pride and accomplishment. ABATE of Florida, Inc Southeast Chapter welcomes all "motorcyclists" no matter what you ride, be it a cruiser, sport bike or dirt bike. Do you live in Florida? Do you ride a motorcycle? If so, you need to join ABATE of Florida, Inc. If you care about your rights as a biker, you'll do it. We are not Anti Helmet, we are Anti Helmet Law! Keep up to date with the Abate Southeast Chapter Events and Calls to Action. • On July 1, 2000, we had the 30 year old Florida Helmet law repealed; July 1, 2010 was our 10th Anniversary of Freedom of Choice. 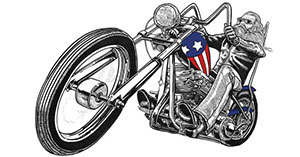 • We’ve become the 4th largest State Motorcycle Rights Organization (MRO) in the country (IN & IL are 1&2, we regularly switch for 3rd & 4th with PA). • We got the handlebar heights law modified. • We successfully fought a bill that would forbid our children from riding on our bikes. • We successfully fought the bill that would confiscate motorcycles for going 30MPH over the speed limit. • We developed an effective MSAP program that has raised motorist’s perceptions and awareness of motorcycles, and have received funding from the State of Fl. totaling over $750,000 to promote motorcycle safety and awareness. • We successfully fought the bill against vertical tags that had over $1,100 in fines for a first offense. • Supported and fought for a texting-while-driving ban for the last few years. • Our 2009-2010 Stiffer Penalties Bill made it through five of the FL House & Senate’s committees; this is the farthest it has gone in the number of years we have tried. On the last day of session, a committee member strenuously attempted to attach a revival of the helmet law to our Bill. To avoid a new helmet law in Florida, we had to kill the Bill. • We publish monthly Press Releases and/or Articles of Interest in many online & print publications, including Florida Full Throttle. • The President of ABATE of Florida, Inc. has been asked to be on and currently sits as a member of The Motorcyclist Advisory Council (MAC) to the Federal Highway Administration in Washington, D.C. The Secretary of the U.S. Dept. of Transportation may appoint a representative from only two State MRO's (Motorcycle Rights Organization) throughout the entire U.S.A. to be on this council. • The President of ABATE of Florida, Inc. sits as the Chairman of the Board of Directors of the National Collation of Motorcyclists (NCOM). NCOM has over 1000 member organizations. Come join the ranks of those who care to be involved!